Hibs suffered their third successive league defeat this afternoon, losing 1-0 to promotion rivals Queen of the South at Easter Road, leaving their hopes of a second place finish in the Championship hanging by a thread. Head Coach Alan Stubbs made two changes to the starting XI that lost 2-1 to Raith Rovers last Saturday. Paul Hanlon returned from injury and resumed his place in the centre of the defence with Keith Watson moving to right back following David Gray’s injury. Jason Cummings replaced the injured Dylan McGeouch with Sam Stanton returning to midfield. Liam Fontaine captained the side in the absence of Liam Craig and Gray. The visitors started brightly and almost took the lead in the 12th minute when a mistake by Hanlon allowed Gavin Reilly a clear run on goal however Mark Oxley did well to block his shot. The ball fell to Derek Lyle who lobbed the keeper but Fontaine managed to clear the ball off the line. On 22 minutes, supporters from both teams stood and applauded in memory of Edinburgh soldier and Hearts’ fan Shaun Cole who passed away following an incident in Miami earlier in the week. 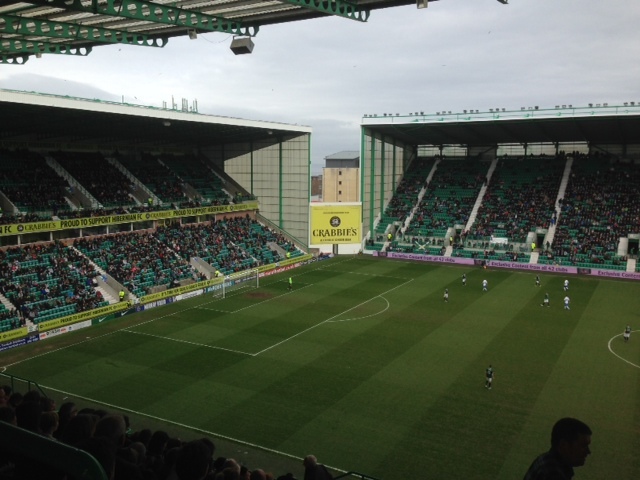 Hibs first chance came on the half hour mark when Fraser Fyvie sent a great through ball to Watson whose cross was just missed by Dominique Malonga. Just before the break Oxley produced a fantastic acrobatic save from Lyle. Queens took a deserved lead just after half time when the Hibs’ defenders failed to deal with a hopeful ball into the box from the left and the ball fell into the path of Mark Durnan who slammed it high into the net. In the 56th minute Farid El Alagui received a standing ovation as he was about to come on as a substitute however when the board went up and the fans realised that he was replacing Cummings, the cheers turned to boos as the opinion of most supporters was that Malonga should have been the player to leave the pitch. A few minutes later, the Congo internationalist suffered more abuse from the Hibs’ fans after taking too long to tie his laces then getting in the way of El Alagui who was trying to get into an attacking position. Queen of the South players were warned about time wasting by referee Calum Murray and in the closing stages Ian McShane and Dean Smith were both booked for kicking the ball away. In time added on, an Allan corner found Djedje at the back post but the strikers shot was blocked on the line. The result leaves Hibs only three points ahead of third placed Falkirk and five in front of Queen of the South. Queen of the South: Clark, Holt, Dowie, Durnan, Higgins, McShane, Reilly, McKenna, Paton, Carmichael, Lyle. Subs Atkinson, Kidd, Mitchell, Smith, Pichard, Smith, Hooper.